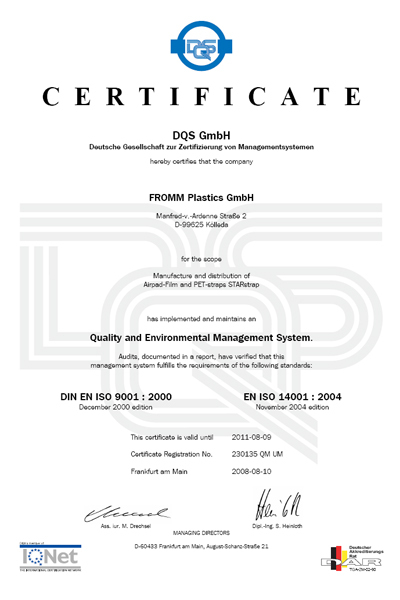 In the scope of our quality and environmental management, FROMM Plastics GmbH’s declared objective is to structure and plan all environmental and ecopolitical activities trying to avoid direct and indirect pollution of the environment. This objective will and has to be reached by introducing a variety of measures achieving continuous improvement of the environmental conditions. Adherence to environmentally relevant laws and decrees is ensured by regularly conducted internal and external audits. At the same time the topicality of compliance with respective laws and decrees is reviewed. Additionally, measurements of emissions are taken in regularly fixed intervals. As a producer of plastic products we attach great importance to continuous improvement of material- and energy use. This is achieved by using state-of-the-art process engineering. With the starting up of an agglomerating plant, an internally closed substance/material cycle has been created. Waste plastic material is being recycled and is ultimately reused as raw material. FROMM Plastics GmbH’s concern is that raw material is largely supplied by silo wagons and not as single deliveries in big bags, resulting in substantial reduction of transportation costs as well as fuel consumption. With increased sales as well as very close cooperation with our customers, FROMM Plastics GmbH is opting to manage the majority of our transportation volume as complete truck loads. Continuous decrease of piece goods (LCL consignments) has a lasting effect on indirect environmental pollution. Increased traffic volume on our roads has prompted us to relocate various transports onto rail. Three loads of produced goods have left FROMM Plastics GmbH during the first half year of 2005. It is our goal to route more of our produced goods bound for sea ports and selected European destinations by rail. Furthermore we are in the process of investigating raw material supplies by railway as well. In the scope of this continuous process of improvement (KVP), suggestions and impulses from our employees are very much appreciated. We will try to implement possible solutions within our range of abilities. We endeavour to improve communication with our partners concerning improvement of all our environmental activities and will keep you updated about the latest developments of our environmental goals. We are open-minded for any suggestions from our partners.